Tools and maps for your yin yoga journey. A simple practice for every body. Slow down. Tune in. Let go. Wake up. Please contact studios directly for bookings. 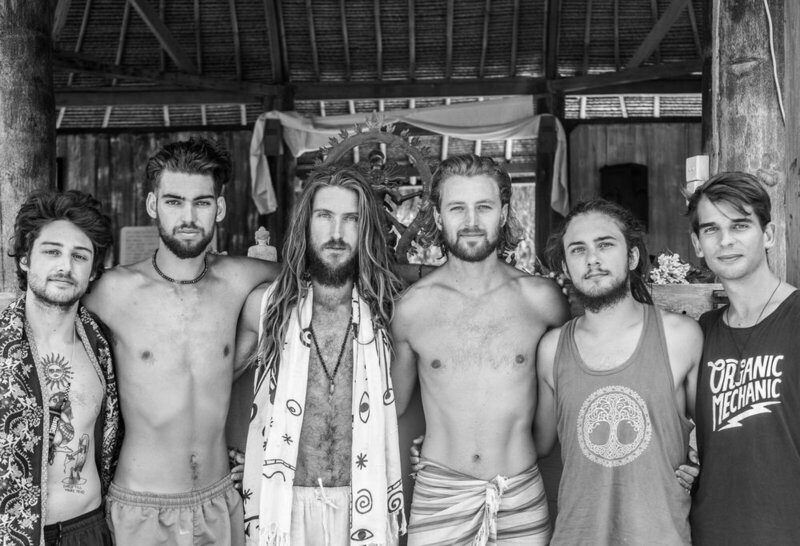 Cacao & Kirtan at Flowers & Fire Gili Air - November 2018. From left to right, Aleks Nikolic, Jenny Ruiseil, Aimee Glucina-Stevens & Nik Robson. Yin Brothers. From left to right. Aaron Petty, Stelios Mousaferiadis, Nik Robson, Simon Lee, Kalem Moore & Gus Wood in the Organic Mechanic top. Slow down, tune in, let go, wake up. 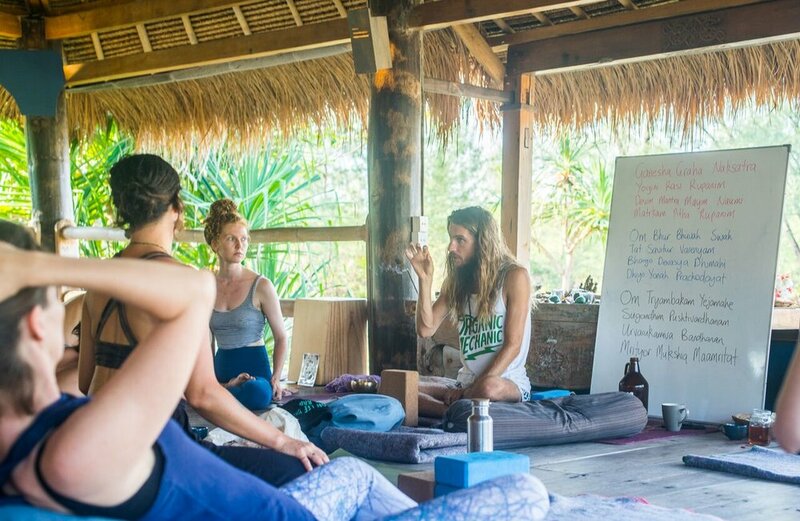 Deepen your own practice and learn the tools to share it. Accomodation and Food provided onsite at additional cost. Total amount to be paid before 8th March. Exceptions - Opening day, closing day, day of noble silence, day of the 6 Hour Yin Journey. • Taoist Philosophy – Understand the universal principals of Taoist Yin/Yang philosophy and learn how it relates to our practice, our lives, the earth and the universe. • Yin Practice – An introduction to the history and lineage of Yin yoga. The foundational principals of a simple practice for every body using the four stages of a yin pose. • Yin Teaching – The art of creating and holding space for Yin Yoga. How to use clear communication to guide students safely and methods for creating themes to share your unique message. • Tantra Yoga Philosophy and Yantra Yoga - Explore the world view of Samkhya Philosophy and the science of Yantra Yoga and how it relates to our dharma (purpose). • Inner landscapes – Yogic maps of the energetic centers (chakras), rivers (nadis) and winds (vayus) and how we can explore them using body, breath and mind through the practice of Yin Yoga. • Anatomy Trains – The science of fascia using maps of the myofasical meridians lines focusing on how we can release and reshape the body through the practice of Yin Yoga. • Mind – Maps of the Mind. Yin yoga as a container for meditation focusing on mindfulness/insight meditation and tantric meditation on energy. • Breath – Exploring the breath as a way of enhancing and complimenting the practice of Yin Yoga to cultivate energy and reach deeper meditative states. • Yin Culture – The balance of Yin/Yang in the context of our modern culture and how we can use our practice to create harmony and balance as individuals and a collective. A variety of methods will be used to create a transformational journey and an educational experience. • Lectures on philosophy, anatomy, teaching, mind, breath and energetics. • Daily masterclass practices of signature sequences. • Pose breakdown workshops of the key Yin Yoga shapes. • Discussion time for questions and sharing of experience. • Day of silence to slow down and tune in. 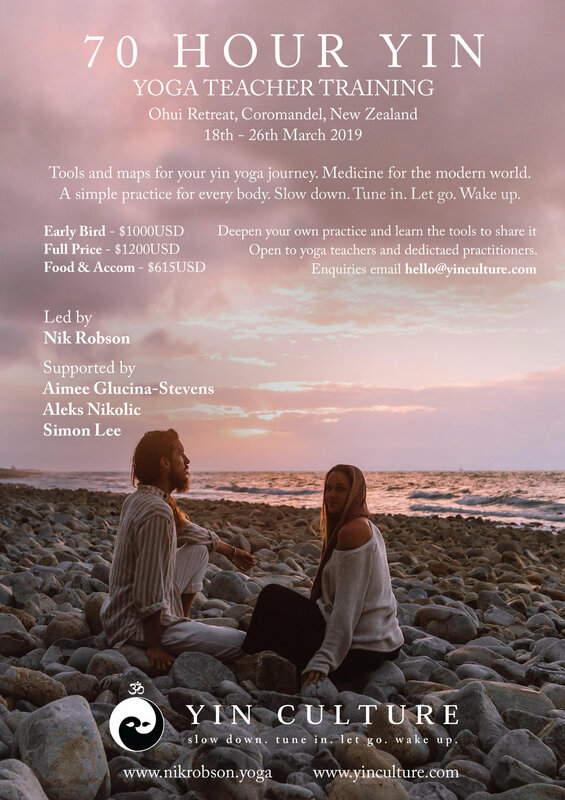 • 6 Hour Yin Journey cocreated by students of the course. • Opening and closing circle. • Free time for rest, reading and the beach.